Wildlife • Officials urge the shooters to switch to nonlead ammo or drag everything they shot out of the woods. Chris Parish | Courtesy The Peregrine Fund An adult California condor from the Arizona/Utah population. Chris Parish | Courtesy The Peregrine Fund An x-ray of a California condor from the Arizona/Utah population shows lead fragments i K. Sullivan | Courtesy Arizona Game and Fish Department Eddie Feltes, left, and Chris Parish, right, of The Peregrine Fund work on Chris Parish | Courtesy The Peregrine Fund An x-ray of a California condor from the Arizona/Utah population shows lead fragments i Chris Parish | Courtesy The Peregrine Fund An adult California condor from the Arizona/Utah population. Chris Parish | Courtesy The Peregrine Fund An adult California condor from the Arizona/Utah population. Chris Parish | Courtesy The Peregrine Fund An adult California condor from the Arizona/Utah population. 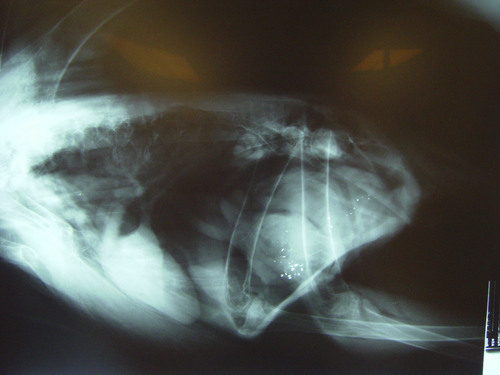 Chris Parish | Courtesy The Peregrine Fund An x-ray of a California condor from the Arizona/Utah population shows lead fragments in its digestive system, likely after it had eaten a gut pile from a deer elk left by hunters using lead bullets. K. Sullivan | Courtesy Arizona Game and Fish Department Eddie Feltes, left, and Chris Parish, right, of The Peregrine Fund work on a California condor from the Arizona/Utah population. 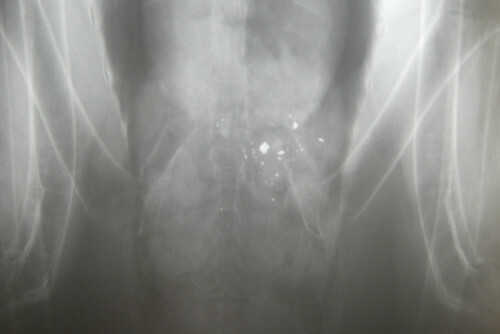 Chris Parish | Courtesy The Peregrine Fund An x-ray of a California condor from the Arizona/Utah population shows lead fragments in its digestive system, likely after it had eaten a gut pile from a deer elk left by hunters using lead bullets. Chris Parish | Courtesy The Peregrine Fund An adult California condor from the Arizona/Utah population. Chris Parish | Courtesy The Peregrine Fund An adult California condor from the Arizona/Utah population. Breaking traditions as old as the first human hunt may be key in the effort to restore condor populations in the desert Southwest. The messy trick is persuading hunters to not only drag their deer, elk and bighorn sheep out of the woods and canyons, but also the innards. That or simply stop using lead ammunition during the hunt. An ongoing program from the Utah Division of Wildlife Resources (DWR) has added new incentives to reward hunters in an area frequented by the rare birds. This month, those who haul out and hand over "gut piles" at five designated checkpoints or show up at the stations with non-lead ammunition will have their names entered in a drawing for an all-terrain vehicle or a new rifle. The checkpoints may be the busiest this weekend, as 60,000 general season deer hunters take the field for the opening of Utah&apos;s largest hunt. 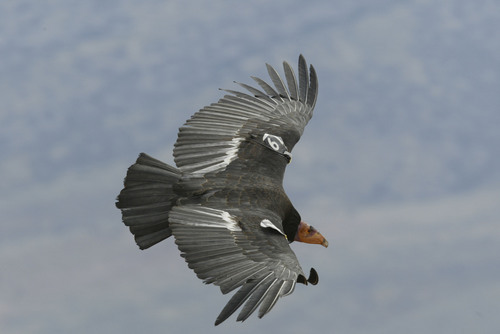 "Condors are spending more time in Utah and are staying through the hunts. There is pretty solid evidence they have been ingesting lead from what hunters leave behind," said Keith Day, a sensitive-species biologist with the DWR&apos;s southern region out of Cedar City. The U.S. Fish and Wildlife Service is convinced that lead poisoning is "the limiting factor" in condor recovery, director Dan Ashe recently told The Salt Lake Tribune. "The science indicates that the principal source of that poisoning is lead fragments picked up from game and the gut piles that are left from the harvested game," he said. "I think that if we are going to recover condors, then we&apos;re going to have to deal with that." While officials often hear complaints about non-lead bullets not being as effective or as accurate, and about the higher cost of copper bullets, Ashe believes habits will change. "Hunters have always been responsible conservationists," Ashe said. "At a personal level, it&apos;s a choice that I&apos;ve made, and actually a choice that my wife has demanded because she said, &apos;If you shoot it with lead, don&apos;t bring it home for me to eat.&apos; I think in the long run, that&apos;s going to be an emerging perception for many people; if you have an alternative, why wouldn&apos;t you use it?" 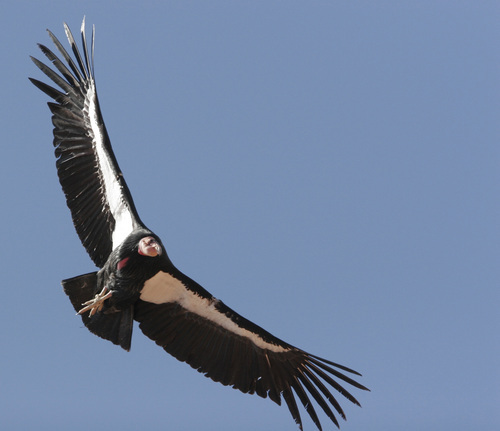 The hazards of gut piles • There were 22 known California condors left in the world in 1987. Wildlife officials decided to capture them all and start a breeding program. 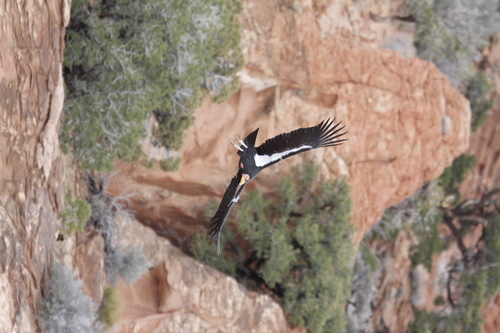 Six condors from that program were released on the Arizona side of the Vermilion Cliffs near the Utah border. As the number of condors being released increased, so did the sightings of the rare scavengers in Utah. According to Chris Parish, project director for The Peregrine Fund&apos;s Condor Reintroduction Project, more than 50 of the known condors in the Southwest spent time in Utah in the past four months. "Come June, the sheep operations on Cedar Mountain are in full swing. ... The natural deaths that occur are a huge resource of carrion for scavengers," Parish said. "About the time the livestock is moved off the mountains, hunting seasons get going and scavengers then become vulnerable to gut piles." Exposure to lead in condors first became a concern, according to Parish, in 2000, but it really showed up in 2002 and again in 2003. Because all the condors in Arizona were being captured annually for exams, Peregrine Fund officials were able to document that upward of 80 percent of the birds were showing high levels of lead. 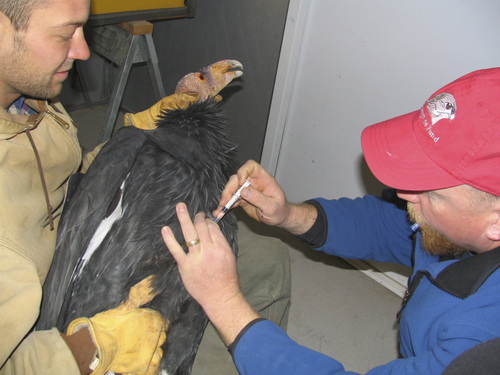 They identified lead as the "most significant challenge to the recovery of California condors." The Arizona Game and Fish Department website says that at least 15 condors have died of lead poisoning since 2000 and that numerous birds have been treated for high lead, including surgeries. Investigation led to the gut piles left by hunters in northern Arizona and southern Utah. Motivation to change • Lead bullets fragment on impact, leaving traces of lead in the carcass and in internal organs (which many hunters target for a clean kill) that are left at the site. Parish said in some cases a single shot with a lead bullet left 400 fragments. Human ingestion of lead, through eating game killed by hunters, has since drawn attention, and high levels of lead fragmentation have been found in processed venison. In 2005, Arizona began offering hunters two free boxes of lead-free bullets of their choice and entering those who turn in gut piles in a drawing for rifles. The state estimates the participation rate has grown to 80 percent to 90 percent. Just last week, California became the first state to ban lead ammunition. Utah&apos;s first attempt at a non-lead program in 2011 drew participation from 7 percent or 8 percent of hunters. But the number jumped to 50 percent last year because the area where attention is focused  known as the Zion hunting unit  went to a draw-only format, which allowed DWR to contact every hunter with a permit on the unit. Day hopes for an even higher participation rate this year among the 2,000 or so hunters on the Zion unit  which runs from Interstate 15 on the west to Highway 89 on the east, State Road 14 on the north and the Arizona state line on the south; no hunting is allowed in Zion National Park. DWR Director Greg Sheehan, who will be staffing one of the check stations this weekend, believes including those who switched ammunition helps boost participation. "Condors do rely heavily on deer remains and keeping gut piles in the field as a food source is important," Sheehan said. "We wanted to reward hunters who made the switch by including them in the drawings along with those who elected to stay with lead, but who bring in the gut piles." The California condor is one of the largest birds in North America. From wing tip to wing tip, it measures 9.5 feet. In 1982, 22 California condors were left in the world. With the help of biologists, they now number around 400, with more than half flying free in the wild. Condors in the Southwest are deemed a nonessential experimental population through the Endangered Species Act.